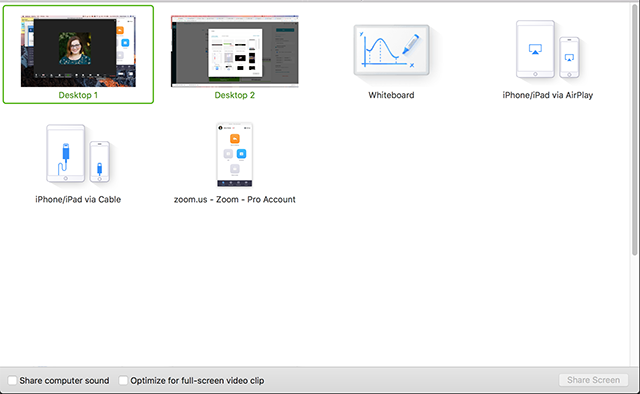 Participants in Zoom Rooms can use one-click direct screen sharing from a Zoom Desktop Client on a Mac or Windows PC. Ultrasonic sound proximity detection enables the iPad controller to generate an ultrasonic signal that can be detected by the Zoom Desktop Client. If the Zoom client detects the signal in a Zoom Room, it automatically connects to the Zoom Room when the attendee clicks Share Screen. If proximity detection is not available, participants can activate direct screen share by entering a Sharing Key, which consists of a string of letters. Zoom Rooms for Android Controller version 1.0.22557.0316 or higher and Samsung Galaxy Tab A 8" or 10.1"
Note: If using Wayland, users will be prompted to enter the Meeting ID to share content. 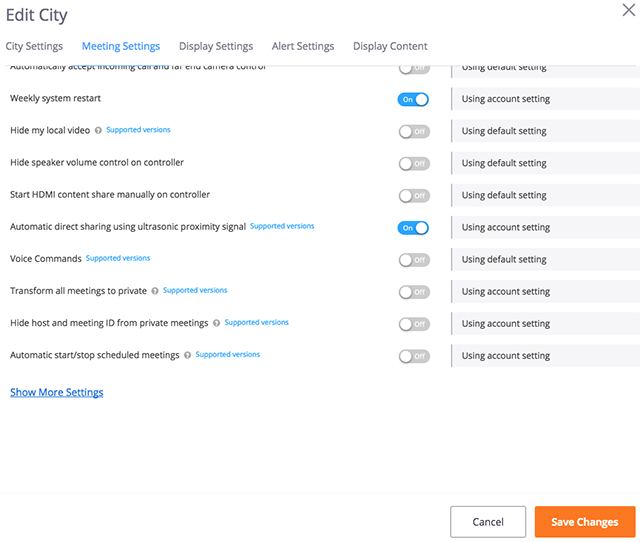 Navigate to the Automatic direct sharing using ultrasonic proximity signal option on the Meeting tab and verify that the setting is enabled. Participants using a laptop in which the Zoom Rooms App detects the proximity signal can share their desktop with the Zoom Rooms meeting by opening the Zoom App and clicking the Share screen icon. Go to Meeting Settings and enable the option Automatic direct sharing using ultrasonic proximity signal. 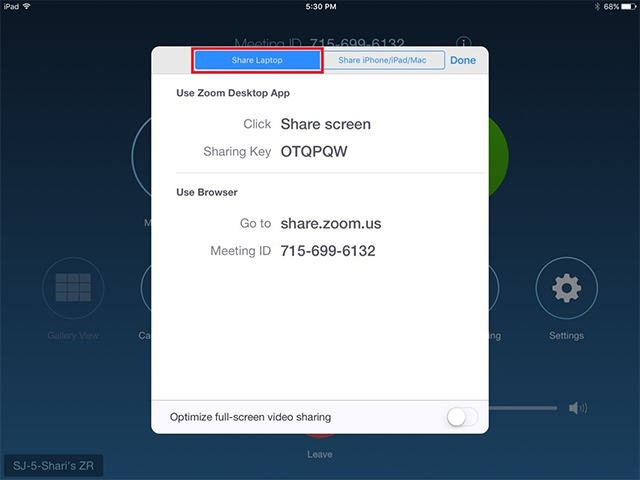 After the meeting begins, click the Share Content button on the iPad controller in the Zoom Room. The iPad controller displays a dialog where you can choose whether to enable sharing for Laptop or iPhone/iPad/Mac. Both the iPad controller and the TV in the Zoom Room display the Share Laptop Screen panel with instructions to laptop users for sharing their screen. Participants can share using either the Zoom Desktop Client or a browser. Participants using the Zoom Desktop Client click Share screen. A dialog displays on their laptop, where they enter the Sharing Key or Meeting ID. If a participant enters the Sharing Key and clicks Share, their desktop displays on the Zoom Rooms TV. If a participant enters the Meeting ID and clicks Share, the sharing screen opens, where they choose a window or application. When they click Share Screen, The Zoom Rooms TV displays the shared Windows Desktop or application that is being shared. Participants not using the Zoom Desktop Client share their screen using a browser. The participant navigates to the share.zoom.us website, where they enter the Meeting ID (a 9, 10, or 11 digit number), then click the Share button. The selection window for screen sharing opens, where the participant chooses a window or application, then clicks Share Screen. The Zoom Rooms TV displays the shared Desktop or application that is being shared.